It’s no secret by now that I love my slow cooker – especially in the summer! It’s the perfect way to make all types of food without heating up the house. Ever since I made Peanut Butter Hot Fudge Pudding Cake, I’ve been looking for a more “summery” pudding dessert. I found a recipe for lemon pudding cake in the same book – Fix it and Forget It, by Phyllis Pellman Good and made some adjustments. 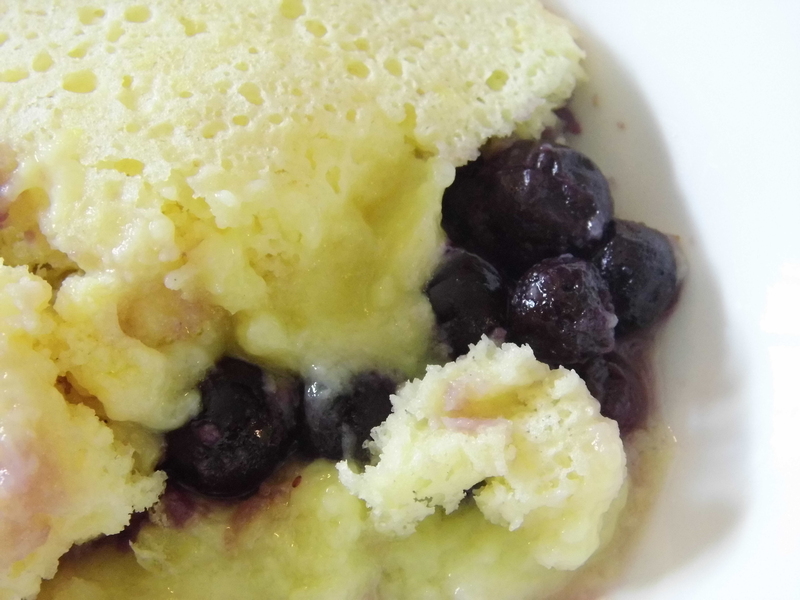 The resulting cake is wonderfully light and lemony – which perfectly compliments the fresh blueberries. The center layer becomes a delicious lemon pudding and is a nice surprise! I will definitely be making this again! In a large bowl, whisk egg whites until soft peaks form. Set aside. In another bowl, combine egg yolks, sugar, lemon zest, lemon juice, butter and salt – beat well. Add flour and milk – whisking until smooth. Fold in egg whites. Lightly grease slow cooker and add blueberries to the bottom. Spoon cake batter over the top. Cook on high for 2 hours. Let cool slightly before serving. I hope you try this recipe – it’s a keeper and sure to be a hit with your family! What are your favorite ways to make dessert during the summer – all while beating the heat? I’d love to hear from you! I’ve made this with raspberry, pretty good, but the seeds in the berries were a little annoying, so I decided that next time I’d puree and strain the berries. Never made it again, because straining raspberries is just too fussy. I’m usually always coming up with tweaks for recipes–why didn’t I think of blueberries? I’m sure I’ll like it a whole lot more. Thanks–I love the great variety in your posts. This looks really good, can’t wait to get my slow cooker unpacked! 🙂 I’d love to hear what you think of it! I have so many desserts to make once we’re all settled in. lol This will be in the top 5 though! You can make a cake in a slow cooker?? Amazing! I will DEFINITELY be making this! i love my slow cooker ❤ I usually resort to making berry and peach crumbles in the summer .. topped with ice cream … but this may be a new fav! Yum…I LOVE crumbles! I don’t know what I would do without my slow cooker! Especially in the heat – it’s in the mid-90’s today…HOT and HUMID! You have introduced me to slow cooking in the summer time – Thanks! I LOVE everything lemony THANKS for this simple one to add to the mix. Me too – it’s very spring/summer! This looks so delicious! I love lemon and blueberry together. My favorite cookie is an almond blueberry cookie with big, fresh blueberries and lemon zest baked into them…so yummy, it’s making my mouth water. Wow that sounds really yummy! I love this flavor combo too..it’s screams summer! That looks absolutely wonderful. Perfect for blueberry season! Thanks! It’s a really great combo! Definitely going to try this recipe. Would be really easy to do with dried cranberries and oranges, too. I love cranberry and orange scones. You are right it would! If you try it with the dried cranberries…I’d love to hear how it goes! I think I’ll give it a shot this weekend. 🙂 I’ll post pictures on my blog. Cross your fingers! « Why I don’t Buy Paper Towels…and other money saving tips!